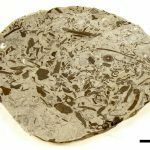 Tiny 135-million-year-old moss fossils found in rocks from western Canada preserve exquisite anatomical details. These fossils open an unexpected window on moss evolution, as they allow for recognition of living moss lineages deep in the fossil record. This way, they add to the notoriously sparse fossil record of the group. Fig. 1. Early Cretaceous layers exposed in the intertidal zone of Apple Bay (Vancouver Island, British Columbia, Canada) (top) contain calcium carbonate concretions (bottom) that preserve plant fossils. Photos © R.A. Stockey and G.W. Rothwell. Fig. 2. A slice of a carbonate concretion exposing numerous plant fossil (dark) on its flat side. Scale bar = 2 centimeters. Fig. 3. 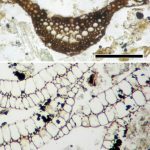 Moss leaves in cross section showing different cell types; above – fossil Meantoinea alophosioides (Polytrichaceae), below – fossil Leucobryaceae. Scale bars are one tenth of a millimeter. Fig. 4. Gemmae of fossil Meantoinea alophosioides (top, center) compared to gemmae of living Tetraphis. Images at same scale; scale bar one tenth of a millimeter. Antheridium (sperm-producing structure) of fossil Tricosta plicata (traced for clarity, at right). Scale bar one tenth of a millimeter. Fig. 6. 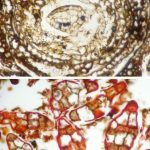 Cells with sinuose walls (above, in two living mosses) seen in cross section (e.g. 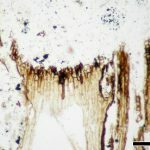 sectioned along the orange lines) are reflected in the lumens of uneven size and distribution observed in cross sections of leaves of fossil Tricarinella crassiphylla (Grimmiaceae) (below). Images not at same scale; scale bar for Tricarinella one tenth of a millimeter. Fig. 7. Leaf cells of fossil Tricosta plicata (Tricostaceae) containing reproductive structures of bryophylous fungus; other fungal structures are present around the moss cells. Scale bar one tenth of a millimeter. Fig. 8. 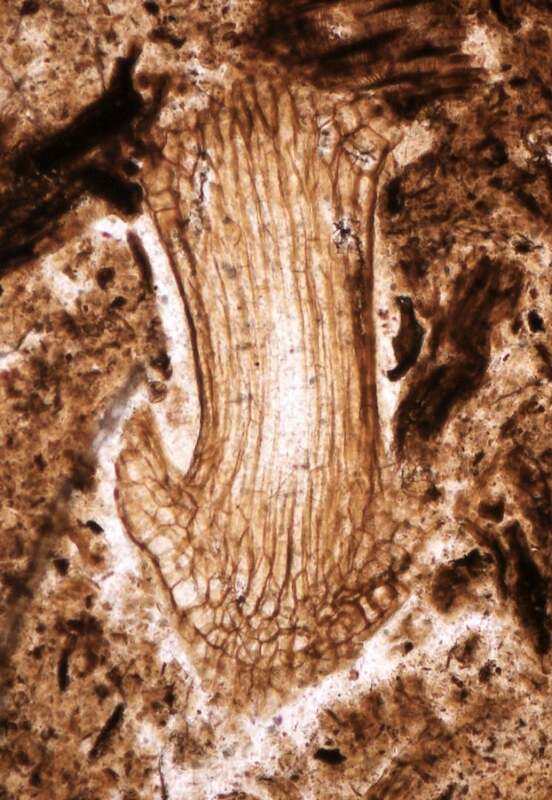 Stem and leaves of fossil Krassiloviella limbelloides (Tricostaceae) gametophyte truncated by an herbivore’s bite show coloration typical of wound reaction. Scale bar one tenth of a millimeter. 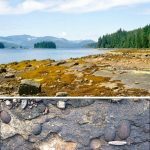 Cretaceous rocks on Vancouver Island (British Columbia) (FIG 1) are revealing rich assemblages of plant fossils (FIG 2) that contain a broad diversity of minute mosses. The moss fossils show unexpectedly delicate anatomical detail at very small scales. Some reveal the arrangement of diverse cell types making up the diminutive leaves (FIG 3). 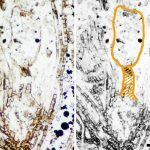 Others preserve structures for asexual reproduction (gemmae) only one tenth of a millimeter across (FIG 4), or sperm sacs just slightly bigger than the gemmae (FIG 5). 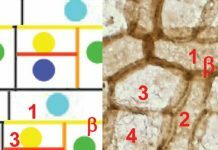 Even details as small as the geometry of individual cell walls (FIG 6) or intracellular interactions with fungi (FIG 7) and microscopic evidence for herbivory (FIG 8) can be observed. 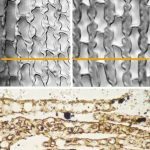 Luckily, uncovering such fine details does not require sophisticated methods, but just the cellulose acetate peel technique, traditionally employed by coal-ball paleobotanists for more than a half-century. The technique involves polishing flat surfaces of the rock and etching them with acid to expose the plant material, which is then picked up on acetone-soluble plastic sheets (‘peels’). All this is possible because the plant material, including all the mosses, was washed off the Cretaceous landmasses by streams flowing into the sea, where the plants sank and were buried in near-shore sediments. The sediments then became cemented around the plants at locations where submarine freshwater springs seeped in, precipitating calcium carbonate. Given their diminutive size, it would not surprise anyone that classifying and identifying mosses often relies on intricate details of their anatomy. However, fossils aren’t famous for their completeness – the finer details are the first to be erased when the going gets tough, during processes involved in fossilization. Thus, discovering fossils that preserve minute anatomical details is rare, but also crucial for understanding where each of them fits in classifications. One important thing the Canadian fossils tell us is that the deep history of mosses includes significant amounts of extinct diversity that can only be gleaned by searching the rock record. Equally important, these fossils reveal the presence of several major moss lineages that have living representatives, much earlier than previously thought. Why are all these important? First, because they fill major gaps in the fossil record. Ever since Darwin’s famous complaint, botanists and biologists alike have decried the imperfection of the geological record in representing the diversity of past life. This real challenge of past biodiversity studies is exacerbated in the case of mosses, for reasons that are just starting to become more apparent. That is why the abundant and diverse Canadian fossil mosses are a treasure-trove. 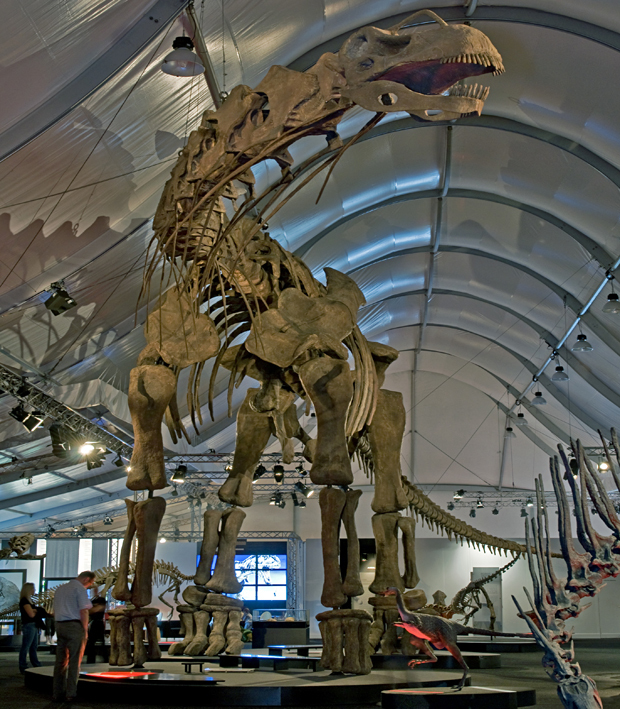 Some of the fossils increase the minimum age of their lineage by 50 million years or more, while others represent the only fossil records of their lineage, known to date. Such data are crucial as calibration points, improving the accuracy of molecular clocks used for dating evolutionary events, as well as for inclusion in studies of evolutionary relationships, to which they contribute resolution. 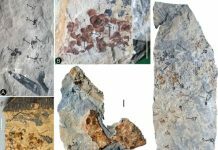 Second, the Canadian material demonstrates the importance of moss fossils that preserve detailed anatomy for understanding the evolution of the group. In turn, this highlights the need to find and to study additional occurrences of mosses with this type of preservation. Fig. 9. Documented occurrences of fossil mosses with preserved anatomy (red dots) in Cretaceous rocks of the west coast of North America. Third, the Canadian fossils helped us develop thoroughly validated search images for anatomically preserved mosses and the rocks that host them. 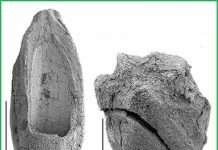 As a result, we now have observations and reports of such fossils from several other locations on Vancouver Island and in California that span most of the Cretaceous (Valanginian to Campanian, about 135-75 million years ago) (FIG 9). 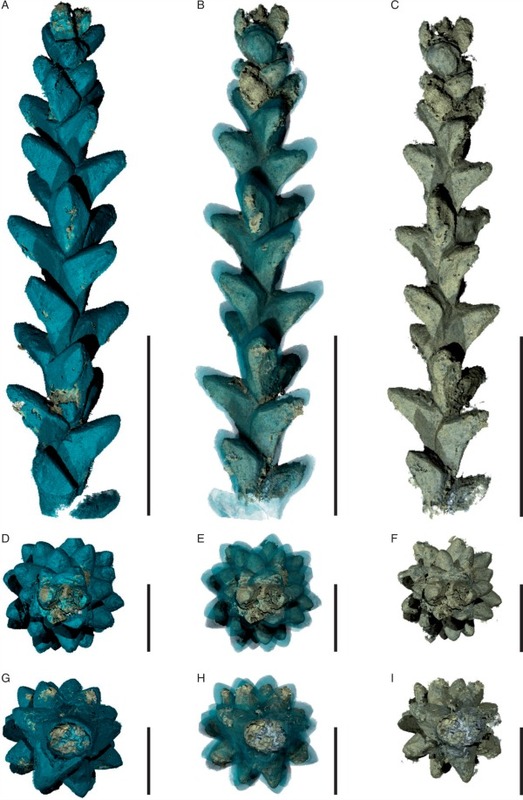 These, and even older (155 million years) anatomically preserved mosses discovered in Upper Jurassic rocks of Argentinean Patagonia (FIG 10), await in-depth characterization and are bound to illuminate equally important aspects of the deep evolutionary history of mosses. 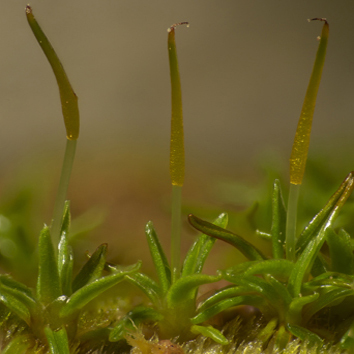 Mosses include at least 7000 species alive today (and some scholars count at least 13000). If what we know about plant evolution is correct, bryophytes (which include mosses) are at least 440 million years old. 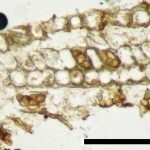 Understanding the origin and tempo of evolution of the broad living diversity of mosses would be impossible without reaching deep into the fossil record, just like without knowledge of the 7 million-year-old hominid fossil record we would lack an understanding of the origins of our own species. Ultimately, this is why these moss fossils with their high-resolution anatomical information are so important. Mihai is professor of botany at Humboldt State University, behind the “redwood curtain” of northern California, where he teaches courses on the structure, development, and fossil record of plants. His interests revolve around plant evo-devo and phylogeny, which he addresses in studies that employ data from morphology, developmental anatomy, and the fossil record.